The harsh, prolonged winter conditions have led to the death of at least 40 mountain ponies in Snowdonia. The national park authority said it is helping graziers bury the corpses of the wild Carneddau mountain ponies on the hills under special measures introduced by the Welsh Government. An extension of the temporary right to bury dead animals on farmland was announced by Minister of Natural Resources and Food, Alun Davies. National park wardens and estate workers will help the Carneddau Mountain Pony Society to bury the bodies of ponies that have died in the severe conditions. 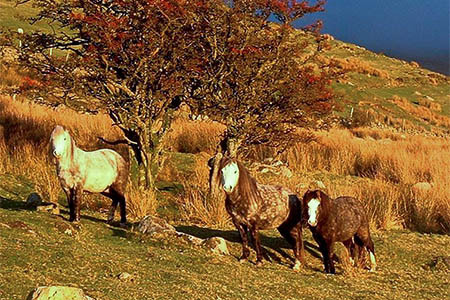 The wild Carneddau mountain ponies have been grazing on the slopes of the Aber and Llanfairfechan Mountain for at least 500 years and because of their special characteristics, they have been listed as one of the wonders of Snowdonia. Although they are more resilient than other breeds of ponies and usually can survive harsh weather, the past few weeks have proved fatal to some of the ponies. Dewi Davies, the national park’s senior warden in northern Snowdonia, said: “Because of the bad weather we’ve endured recently, a number of the Carneddau ponies have died in the snow and disposing of their bodies, because of their remote location, is proving to be difficult. “In addition, this particular area is of European importance due to its wildlife and therefore it will be a challenge to transport the bodies off the mountain without damaging the terrain. Gareth Wyn Jones, secretary of the Carneddau Mountain Pony Society, added: “The loss to the society has been heartbreaking but lifecycle is a funny thing. “This has happened before in 1947 and half the ponies died. The old, the young and the weak have suffered and, to date, 40 dead ponies have been counted. The national park authority said Welsh mountain ponies and their genetics have an important role to play in sustaining the diversity of plants and insects on the mountain slopes. Their grazing patterns mean that they keep vegetation low on the mountain in winter and provide a good source of food to the chough during the winter. This in turn allows the fragile habitats of the highland to be revitalized when the sheep aren’t there. Disposal of fallen stock must comply with the European regulation on animal by-products. Any fallen stock must normally be disposed of to approved premises without undue delay. Carcasses should be kept secure until disposal. However in the severe weather conditions, the Government is asking farmers to be aware of the needs of the regulations and to dispose of fallen stock as soon as practical. I believe Tesco's in Llandudno Junction are very interested in helping 'dispose' of the carcasses too!